Menulog delivers for Hub Cafe Kitchen so you'll be able to track your courier on a map. Rosemary, garlic butter, herbs and chilli. Hub made and Napoli sauce. Chilled caponata, salsa verde and balsamic glaze. With blue vein cooling dip. American style hickory BBQ sauce. Tender as sea salt, red onion and garlic aioli. Raw slices of beef tenderloin, fried capers, aioli and micro salad. Toasted sesame, apple cider dressing and Asian slaw. Pear, fresh spinach and tomato garnish. Stir fried, garlic-herb marinade, spinach and tzatziki. Chat potatoes and fresh veggies. Slow braised pork belly with tender tempura style calamari. Our 220 gram eye fillet medallions with mushroom and red wine jus topped with tender tempura style calamari. Eye fillet medallion, mushrooms, red wine jus, slow cooked pork belly, cider glaze and creole chicken tenders and avocado salsa. Full serving of our eye fillet medallions with mushrooms, in red wine jus and our garlic prawn cutlets (5 pieces). 8 Hour braised with tomato, lamb and rosemary jus, potato feta croquette and roasted seasonal vegetables. Cajun spiced chicken and avocado-tomato salsa. Panko crumbed chicken breast, filled with camembert, sun-dried tomato and spinach with fresh pesto basil sauce. Louisiana spices, diced tomato and garlic crème served with potato feta croquette and veggies. Pork medallions, heaping mushrooms, smooth and creamy jus. Eye fillet medallions prepared medium, mushrooms and Hub port jus. Crispy skin, salsa verde and diced tomato garnish. 2 x Fried eggs, lean bacon, lamb sausage, pork belly, field mushrooms, avocado, blistered tomato, house feta croquette, tomato relish and sourdough toast. Salami, chorizo, red onion, olives, mushrooms and mozzarella. Oven blistered tomatoes, bocconcini, fresh basil, oregano, mozzarella and EVOO. Kalamata olives, anchovies, mushrooms, mozzarella, bocconcini cheese, fresh basil, oregano and EVOO. Moroccan spiced yoghurt, lamb sausage, eggplant, red onion, spinach and mozzarella. Pulled pork, caramelised granny smith apples, toasted walnuts, pumpkin, spinach and mozzarella. Fresh pesto, roasted pumpkin, grilled eggplant, roasted capsicum, Spanish onion, feta cheese and mozarella. Choice of chips or hub slaw +$4.90. Lean beef patty, Swiss cheese, lettuce, tomato, aioli and caramelised onion. Mozzarella, lettuce, tomato, aioli and Napoli sauce. With spicy buffalo sauce, bacon, tomato, cos lettuce, Caesar dressing and shaved Parmesan. Slow cooked pulled pork, Hub slaw, apple and pork jus. Lean beef patty, avocado, halloumi, lettuce, tomato and aioli. Lean beef patty, slow cooked pork belly, smashed avocado and spicy beef salsa. Eye fillet medallions, caramelised onion, cheese, lettuce, tomato and aioli. Our spaghetti Napoletana tossed with our homemade spicy meatballs. Our spaghetti Napoletana pasta topped with a fresh chicken Parmigiana fillet. Our stuffed chicken Fiorentina main meal on our sensational linguine Genovese pasta. Eye fillet scaloppini medallions (medium) and creamy truffled mushroom spaghetti. Braised lamb shank in red wine jus with our linguine vegetariana rosso pasta. With béchamel sauce, lean ground beef, Napoli sauce, slow roasted tomatoes shaved Parmesan. Wilted spinach, pesto béchamel sauce, creamy Napoletana, shaved Parmesan and slow roasted tomato. Pulled veal, ricotta, eggplant, ragu cannelloni, wilted spinach, shaved Parmesan and creamy mushroom jus. Fresh chilli, garlic, onion and fresh herbs tossed in extra virgin olive oil. 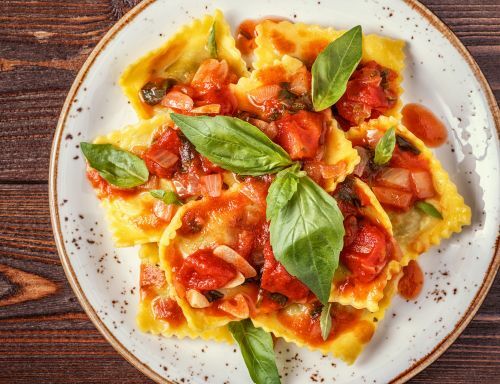 Tossed in our rich roma tomato and basil sauce. Traditional recipe from Bologna and Italy. Tossed in a light creamy sauce with lashings of bacon, onion, shallots, garlic and egg. Kalamata olives, anchovies, capers and fresh herbs tossed in our fresh Napoletana sauce. Truffled and button mushrooms in a creamy white wine sauce, fresh spinach and herbs. Chicken tenders, sun dried tomatoes, mushrooms, peas, blend of fresh pesto and Napoli sauce. Mediterranean veggies, Kalamata olives, Persian feta and Napoletana sauce. Mediterranean veggies, Kalamata olives, Persian feta and fresh cream sauce. Our fresh homemade creamy pesto sauce and fresh spinach, sun-dried tomatoes. Chicken tender, sun-dried tomatoes, green peas, spinach and creamy-tomato cajun sauce. Hub’s amazing creamy Genovese pesto pasta tossed with fresh chicken tenders. Tassie smoked salmon, fresh spinach, tomato bruschetta and light creamy salsa verde sauce. Scallops, prawns, calamari, mussels, garlic and fresh herbs tossed in Napoletana sauce. Scallops, prawns, calamari, mussels, garlic and fresh herbs in a light creamy sauce. Prawns and scallops tossed with garlic, chilli, onion, fresh parsley and extra virgin olive oil. Napoletana sauce with fresh chilli and basil. Creamy Napoli sauce, sun-dried tomatoes and splash of vodka. Lashings of smoked bacon, fresh chillies, shallots and Napoli sauce. Prawns, sun-dried tomatoes, spinach, crushed pistachio nuts and creamy-tomato cajun sauce. Tossed in a creamy Parmesan sauce with a hint of nutmeg. Bacon, mushrooms, green peas and parsley in a light creamy Napoli sauce. Chicken tenders, chorizo, smoked bacon and Bolognese Ragu sauce. Add one to your gourmet salad +$7.40 each Tasty Toppers: Tempura calamari, chicken tenders, garlic chilli mushrooms, pulled pork, battered Barramundi, grilled halloumi, smoked salmon, Greek style prawns or Spanish chorizo. Roasted beetroot, Persian style feta, pear, pumpkin, toasted walnuts, rocket, spinach, salad, red onion and balsamic glaze. Fresh tomato, avocado, salad greens, corn kernels, Mexican beans, roasted pumpkin, Kalamata olives, poached egg, shaved Parmesan and blue vein ranch dressing. Salad leaf, tomato, salad onion, roasted bell peppers, Kalamata olives, avocado, feta and Italian dressing. Cos lettuce, garlic croutons, bacon rashes, egg, anchovies and Caesar dressing. Prepared with love and our own hub twist. Chunky chips topped with mozzarella and blue vein melt, red wine mushroom jus. Chunky chips topped with mozzarella cheese, warm creamy basil pesto sauce and fresh Parmesan. Spicy ground beef, tomato salsa and cheese melt. Pulled pork, mushrooms, Persian feta and red wine jus. Served with extra virgin olive oil and balsamic. Rustic bread with confit garlic-herb butter. Rustic bread, mozzarella and garlic-herb butter. With fresh herbs, garlic butter and mozzarella. Heaping chunky tomato bruschetta, fresh basil, on crispy rustic bread and extra virgin olive oil. With your choice of the following hub toppers: Mediterranean vegetables, Greek salad, fresh avocado, smoked salmon, hub pulled pork, grilled halloumi, chicken beetroot salad or chicken Parmigiana. Chilli, bean and lean ground beef. Wilted spinach and Parmesan cheese. Eggplant, zucchini, capsicum onion and Napoli sauce.